Countdown was a weekly pop music show from the Veronica broadcasting association. It was one of the two big music programs on Dutch national TV, Toppop from broadcasting association Avro being the other. 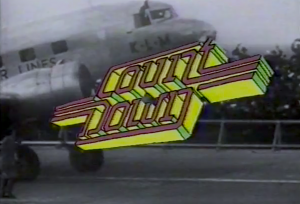 Countdown ran from the end of the 70s until the beginning of the 90s. While Toppop was more dominant in the 70s, Countdown probably was the most popular music TV show in Holland during the 80s. Most of the shows were being recorded with audience at the Concordia building in Bussum, a village close to Amsterdam. In its heyday, Adam Curry (later to become MTV VJ) was the host of Countdown. He became quite a celebrity in Holland. Tall in person but also in hair, wearing an impressive fashionable mullet by 1987. 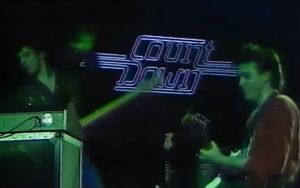 The Cure were quite regular guests at Countdown. They played at the Countdown Festival in Amsterdam in 1980 and visited the Countdown studios four times for miming performances from 1984 to 1987. 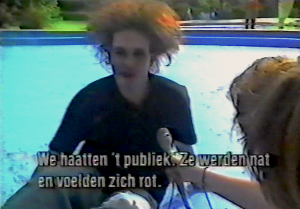 In 1986 Countdown showed reports from the Pinkpop Festival in which The Cure were featured with some live bits and interviews. Also, over the years, the Tim Pope videos were broadcasted numerous times. Below is – I hope – a complete overview of The Cure’s appearances on Countdown (not including their video broadcasts). If I still missed anything, please let know! The links to the videos work on a computer from the Netherlands, maybe not all of them on a mobile device or from another country. Seventeen Seconds was a very successful LP in the Netherlands and demand here stayed high to see the band live. So The Cure kept returning to Holland to play concerts throughout 1980. In July, their open air show in Apeldoorn was recorded for TV (by broadcasting association Vara), and then Veronica asked The Cure to perform at the ‘Countdown Festival’ at the Jaap Edenhal (an ice rink) in Amsterdam on 17 October, to be recorded for TV and radio. It was the first night of a two-day festival. Besides The Cure, on 17 October Sniff ‘n’ the Tears and Pat Benatar (!) played. On 18 October Raymond van het Groenewoud, Madness and The Specials were on the bill. That night The Cure had some problems. They arrived late and had to do a soundcheck in front of the audience. The band played an E Chord for a couple of minutes, baptised by Robert as I Hate Rock ‘n’ Roll. According to an interview published in the magazine Puls, Robert broke a snare on his guitar during the show. Lol and Simon started to laugh, which brought Robert completely off-balance. In addition, the cameraman thought he witnessed something sensational and captured Robert in close-up, which angered Robert even more. He was about to throw his guitar towards him. Instead, since Robert had two identical guitars, he immediately picked up the stand-in. But when he stroke the first chord, exactly the same snare broke again. Video footage of this gig has been broadcasted a couple of times with varying track listings, comprising five songs in total. The Countdown edition of 25 February 1981 (which may have featured the first broadcast) also contained an interview with the band taken before the show. Hot topic appeared to be Matthieu Hartley, who had just left The Cure. Here are some links to the Countdown Festival 1980: Interview (only version around), 10:15 Saturday Night (only version around), Jumping Someone Else’s Train – Another Journey By Train (very good image), Grinding Halt (very good image, cut at the end), A Forest (very good image), Jumping Someone Else’s Train – Another Journey By Train – Grinding Halt – A Forest (different broadcast), A Forest (great edit by Impression of Sounds). 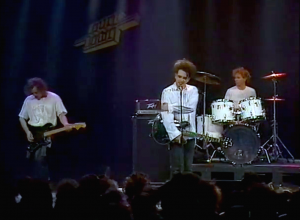 After having finished the European leg of the Top Tour, The Cure (without Phil Thornalley) returned to Holland for their first miming performance at the Countdown studios, probably at the beginning of June 1984. This performance is maybe their weirdest one. Robert, Lol, Porl and Andy were being presented as a sort of cocktail band, all dressed in suits, ‘playing’ acoustic instruments. By then Robert had already developed his unique style of lip-syncing, appearing to be in his own world and obviously not taking it all too seriously. You can read some more about this particular performance and the events that had happened just before here. 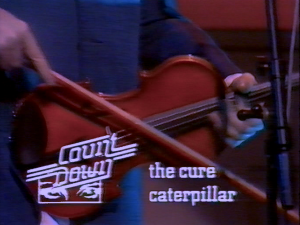 Video link: The Caterpillar on Countdown, 1984. Of all the Countdown performances The Cure have done, the one in 1985 must be the most legendary. The Cure were joined by Bananarama on stage. In the end only Boris kept playing, while the rest of the band had swapped instruments with Bananarama or just fooled around. It all looked like a jolly (and I guess drunk and/or drugged) party. Teenage magazine Popfoto published a bit silly article about it. Bananarama would have told them they had met The Cure at a London airport. All of The Cure wore dark sunglasses, which made them stand out even more. They found out that both bands were heading for Holland to perform at Countdown that day. It was already big fun on the airplane. Later at the Countdown studios, after Bananarama had done their thing, they saw The Cure miming to Close To Me and thought ‘well, let’s join them!’. So it happened. Popfoto wrote that the bands were considering to release a joint single, like an old Tom Jones song or so, for which Siobhan would have come up with the name ‘Bananacurerama’ (…). Adam Curry announced In Between Days as ‘the song that is currently a hit in the Top 40’. So, according to the Top 40 statistics, I think this performance was recorded some time at the end of August or early September 1985. 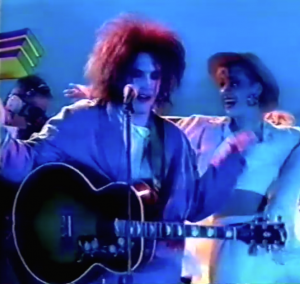 About seven months later, in April 1986, The Cure visited Countdown again to promote their new (re-recorded) single Boys Don’t Cry and the upcoming compilation Standing On A Beach. Adam Curry asked Robert about the Bananarama incident, but apparantly nothing happened afterwards. A not so very smooth interview followed, after which the band did another funny (drunk?) miming performance. The same day, at the Countdown studios, Robert was also interviewed by music magazine Oor for their special Pinkpop edition. You can read that article here (Pictures of You). And here you can find some very nice photos of this Countdown performance (scroll down). Video links: Countdown 1986 (very good image), Countdown 1986 (slightly longer intro). You can read more about The Cure at Pinkpop 1986 here and here. Video link: Countdown Pinkpop 1986 report (thanks to Impression of Sounds). The TV promotional tour for the then current single Why Can’t I Be You? plus upcoming single Catch, both off the new double LP Kiss Me Kiss Me Kiss Me, brought The Cure to the Countdown studios for the last time. I think the videos mentioned below were all recorded on the same day, judging from the clothes, stage setting and so on. Also, of course, this would be the most efficient because The Cure were pretty much fully booked for the rest of the year. Since Robert ‘helps’ Adam Curry presenting the Top 10 of week 18 1987, I think all of this must have been recorded late April 1987. By then there was also an international version of Countdown, broadcasted via Sky Channel amongst others. As far as I know, the longer interview of Adam Curry with Robert without subtitles was never broadcasted on Dutch television. Top 10 countdown (plus interview and Why Can’t I Be You?) of the Top 40 of 2 May 1987 – this is probably my favourite bit. Hilarious to see how Robert pronounces Dutch folk singers and slates the rubbish that was in the charts at the time. Catch (very good image) – quite laid back performance, in my memory broadcasted some time around the release date of this single in June 1987. After that The Cure never returned to Dutch pop music shows. If I am right, apart from Top of the Pops, they didn’t do any promotional performances for Disintegration singles. Despite of this, Lullaby became their biggest hit ever in Holland, peaking at number 9 of the Top 40 at the end of May 1989.